Please write your hotel name, Hawaii address or the Cruise Ship Name and Pier Number. Your pick-up location and time will be provided with your confirmation. The Pearl Harbor Excursion is the most basic tour to Pearl Harbor. 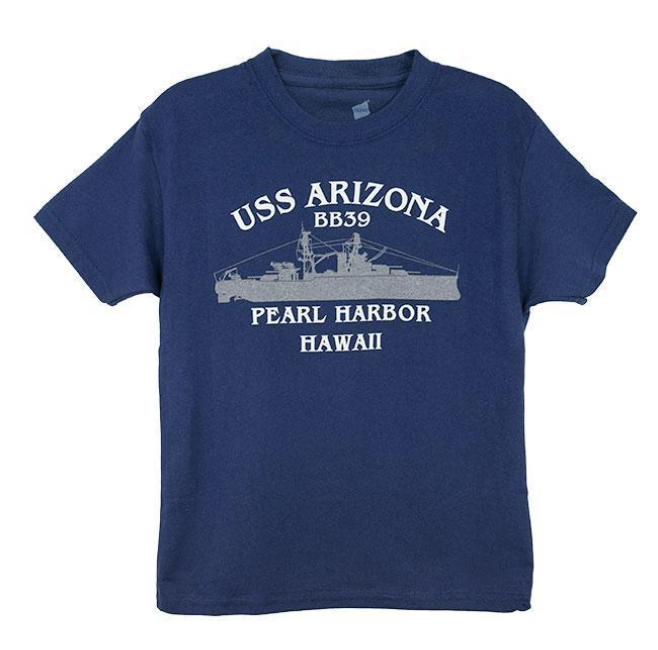 It’s perfect for those who want to see Pearl Harbor, but don’t want to spend an entire day there. After hotel pick-up, your guide will tell you about the history of Pearl Harbor and share cultural information on the way to Pearl Harbor. When you arrive at Pearl Harbor, you can visit the museums with fascinating artifacts, replicas, and multimedia displays that will help to explain the events and the details leading up to and following the attack on Pearl Harbor. In the theater, you will watch a movie about the attack on Pearl Harbor before boarding a US Navy shuttle boat to the USS Arizona Memorial. On the memorial, pause and pay tribute to those who lost their lives on December 7, 1941. There are snack shops and gift shops at Pearl Harbor. The park service has done a great job in adding exhibits which put the attack on Pearl Harbor in context. This whole area is worth the trip. Beautiful tribute to our nation’s history. The video prepares you, but watching sailors salute the site where so many perished becomes overwhelming. Listening to the guide explain how those that survived join their shipmates as their death, again is overwhelming. The Arizona is not to be missed as well as the museum detailing the events before, during, and after. Very humbling experience. No bags or purses allowed. Very informative. Excellent experience. A definite must see. Very emotional site, see and experience for yourself! Taking a tour is the best way to go with door to door transportation, no lines for tickets, etc. No words can describe this wonderful visit. Puts everything in perspective, the entire complex is so informative and unbiased in telling the story of how the us got involved in WWII. Enjoy! Traveled just a few weeks ago to beautiful Hawaii….first tour we signed up for was Pearl Harbor! Our driver was native to the island and she was fabulous, extremely knowledgeable and fun to be with. She gave us wonderful tips on where to get in line, where to sit, etc. which was very helpful. The Arizona video was very tastefully done. The message very clear. Visiting the Arizona was a sad remembrance and reflection. I am so appreciative of our service men and women that fight for my freedom at the risk of losing theirs. Visiting this amazing place is a sobering reminder of the price Americans have paid for freedom. The dioramas, movies, and displays bring to life the simple things our Sailors were thinking about or preparing for in the minutes and hours before the bombing of Pearl Harbor. I love history and I am so proud to be an American and to honor the men and women that gave the ultimate sacrifice for our country. The Rangers on site are excellent in “making it real” and what it all means for us in this day and age. The emotional bond Americans have to this memorial is very personal and evident once you step inside. Architecturally planned and executed to touch no part of the USS Arizona below, you feel the sacredness immediately. Most impressive and memorable. I would however, caution, no purses or backpacks allowed. Our first destination when arrived to Honolulu. Even if you know the history I felt it was an important experience to be at Pearl Harbor and get a feeling for its location and surroundings. We liked to museum and the trip to the USS Arizona. Full of educational material on Pearl Harbor and the Second World War. Even back to the day of independent Hawaii. By far the best submarine museum I have been on. You get to see all aspects of life on a sub and the surrounding support info is great. So educational for us and honoring of those who’ve gone before us for us. As long as you’re elementary age or above, go! The video is extremely well done and explains clearly what happened and the devastating results. It was a significant part of history to learn about. 1177 names are recorded as having died that day. No trip would be complete if one doesn’t visit this remarkably historic site. This visit is well worth your time. A good place to revisit history. Very well kept and organize. Very accessible and affordable. A somber silent experience that words will never do justice for. My 11 year old is a student and immediately listed as a place he wanted to visit when told we were vacationing to Hawaii. Reading about WWII and the chain of the events does it no justice. If you’re anywhere near it’s a MUST do! Seeing where all the lives were lost is saddening but also a place of reflection of the past. Very good history lesson. My wife and I came to Hawaii for our honeymoon. We planned on hitting all the beautiful scenery locations, and also made a point to stop at Pearl Harbor. It was an immensely moving experience for both of us. The Pearl Harbor memorial was so wonderful! It is such a unforgettable experience. The attack on Pearl Harbor became real to us. It wasn’t something you just read about in the history book. You MUST visit Pearl Harbor if you’re on the island of Oahu. The history is amazing and sad. Arizona memorial is heart rendering. Shows how America was attacked and then came back in full force. The museum was so informative. They had a mini version of the USS Arizona. They have little mini clips and artifacts from that December day. I loved seeing the anchor and the different monuments. We witnessed men who had been at the attack. All Americans should have the opportunity to experience the War Memorial at Pearl Harbor. I left with a new perspective of what actually happened there. Is there plenty of time for a relaxed tour of the museums? Can we bring a camera in? Yes. There is approximately 1 hour to peruse the museums and exhibits at the Pearl Harbor Visitors Center. That is in addition to the scheduled program with the movie and the boat to the Memorial. Cameras are allowed. Just don’t bring your camera bag. Looking forward to scheduling this tour for 8 people. Is there plenty of time for a relaxed tour of the museums? Is this also with a guide? Can we bring a camera in? Are there many stops on the way picking up people? We want to add the 45min city tour also. How does this work? There is plenty of time to look around the museum at your own pace. 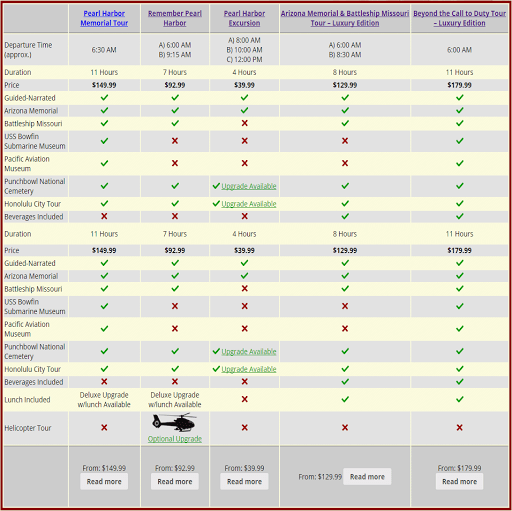 You may choose to rent an audio guide while you are at the Pearl Harbor Visitors Center. It provides a great narration of the exhibits and is useful on the boat and at the Memorial as well. Please see our FAQs about cameras. You can bring one, but not the bag. The number of stops depends on the number of hotels people who book are staying at. Usually it’s 5-6 stops. On the drive back to Waikiki, the city tour add-on detours through the historic district of Honolulu where your guide will point out sites of interest. You will also drive inside the volcanic crater Puowaina, where Punchbowl National Cemetery is. As a non American with no fascination for war I frankly found this rather under whelming. Yet, I saw many Americans, who I was with, enjoying the history in the museums and feeling patriotic. 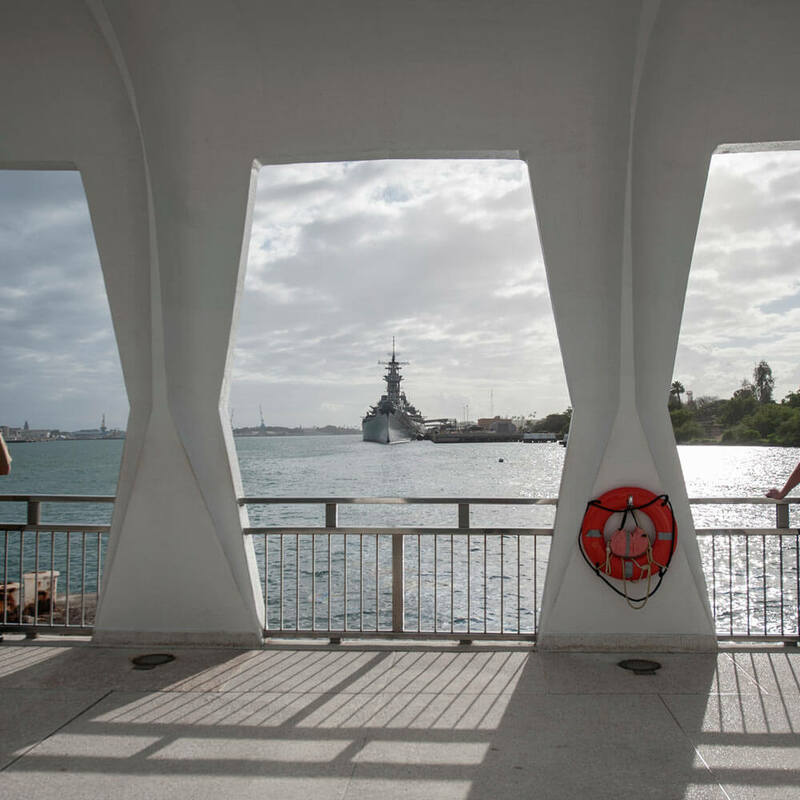 Do you get to board to USS Arizona Memorial and see all the rooms on this tour? Yes. All of our tours to Pearl Harbor include a visit to the Arizona Memorial. When you visit the Arizona Memorial you will see all of the rooms. Do you have to wait in the long line? Your tickets will be arranged in advance, so you will not have to wait in a long ticket line like those who do not have tickets reserved. When you arrive at Pearl Harbor, there may be a line to walk into the entrance. At first it felt like it was an a amusement park. In my opinion the gift shops took away from the meaning. Then strolling through the museums, they were very educational. Recommended for education and patriotic value, but prepare yourself for crowded tourism. A great companion to the Pearl Harbor Arizona battlefield memorial, this 4 hour tour was very informative. Museum exhibits with lots of artifacts. Everyone should come to thisn place and experience it first hand and reflect on what took place on Dec 7th 1941 and know how much the world owes these sailors who still lay at peace under the water right below your feet. We had a lot to fit in on our family vacation to Hawaii. Thought that fitting in Pearl Harbor couldn’t be done, but this 4 hour tour was perfect! Glad we took it. Learned a lot from the tour guide and the tour itself. Especially the 25 min short film. Obviously Pearl Harbor is a must do while you’re here. Visiting Pearl Harbor, The Arizona Memorial and the USS Missouri was honestly THE best day I spent i Hawaii. The respect to the history, the information on the day a& the lives lost, the heroes who survived & rebuild the ships, the Memorial, and the entire monument area was fantastic. It is a feeling of wonder as you visit this memorial in this beautiful paradise, for those there it was no paradise, just a horror and a memory. It worked to get the US involved. Without a doubt the highlight of our stay in Honolulu. Well preserved, respectfully maintained. A must-visit for sure.It was awesome, really. It gives you a real sense of what those protecting the harbor must have experienced. This got us into the Pearl Harbor area on a tour bus and the boat ride to the memorial. Had a wonderful experience. Guides were very knowledgeable. The museum was very informative. Handouts were very helpful. Lots of people though!